Heavy-Duty steel tray braces provide added strength and support when pouring heavy loads. Glide-ring design on steel trays won't catch shovels or hoes. Wagon/Wheelbarrow Type: Wheelbarrow; Capacity (Volume): 6 Cu. Ft.; Overall Dimensions: 25 1/2w x 58 3/4l x 27h; Material(s): Steel/Wood. 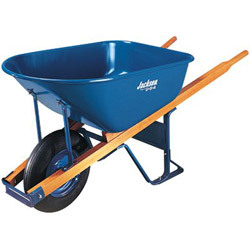 Wheelbarrows and Parts from Jackson Professional Tools! 35 In Stock today.